The four innermost planets in the Solar System (Mercury, Venus, Earth, and Mars) are sometimes called the "terrestrial" planets because of their proximity to Earth ("Terra" in Latin) and their similarity as compact solid bodies with rocky surfaces. These four planets developed from small grains of dust that collided and stuck together to form pebbles, boulders, kilometer- and mile-sized planetesimals, and larger planetary embryos and protoplanets). They formed in the inner portion of the protoplanetary disk located closer to the developing Sun during the first 100 million years of the System's birth, where it was too warm for the four developing protoplanets to agglomerate water and more volatile ices and bulk up sufficiently in gravitational might to hold onto the abundant but lightest gases of the Solar nebulae (hydrogen and helium) to become "gas giants." Although rocky (and icy protoplanets beyond the Solar System's 2-AU "ice line") formed in the Main Asteroid Belt, the early development of Jupiter prevented protoplanets like icy Ceres from agglomerating into larger planetary bodies, by sweeping many into pulverizing collisions as well as out into the Oort Cloud or beyond Sol's gravitational reach altogether. beyond Mars orbit is also available at the Minor Planet Center. According to astronomer Alan P. Boss (Astronomy, October 2006), many astronomers now believe that the development of planetesimals into protoplanets as large as the moon was a runaway process, where a young Solar System may have developed a swarm of hundreds of Lunar-mass protoplanets in as little as 100,000 years. 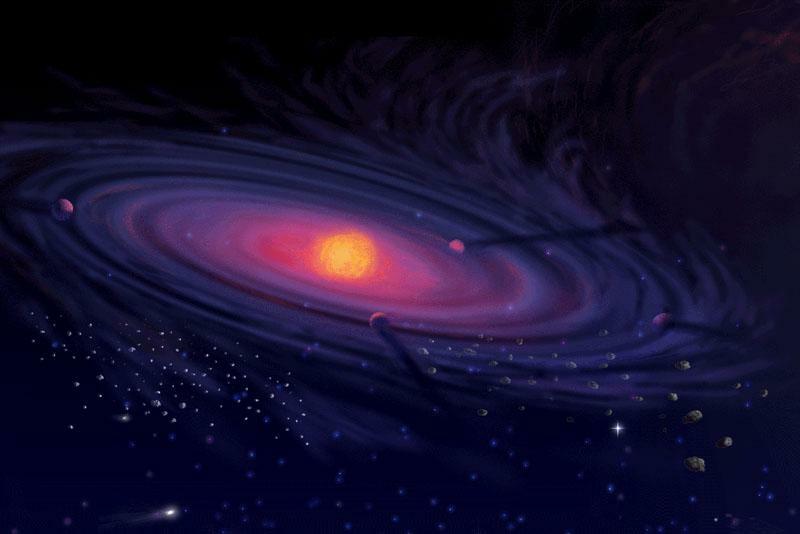 In a longer, succeeding phase of growth into Mars-sized protoplanets, however, these objects interacted gravitationally over many orbits so that their initially circular orbits became increasingly elliptical and they collided and merged into larger bodies over tens of millions of years. Colliding at speeds up to 22,000 miles per hour (36,000 kilometers per hour), such a collision may have stripped most of the rocky mantle from the protoplanet that became Mercury with its iron-rich core, while a Mars-size protoplanet struck the early Earth off-center and created a spray of mostly mantle material that later accreted to form the Moon. The larger terrestrial planets, Earth and Venus, probably needed tens of millions of years to grow to their current size through collisions with large planetary embryos of 1,000 to 5,000 kilometers (620 to 3,100 miles). 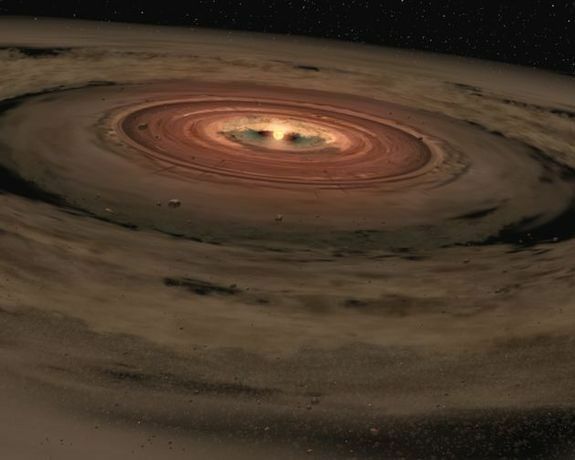 By modelling the process of planetary accretion, astrophysicists would have expected Mars to reach the size of the Earth at its orbital distance within the early Sun's circum-Solar gas and dust disk. Mars, however, has only 11 percent of Earth's mass and 53 percent of its diameter and so may have taken only two to three million years to reach its present size. By measuring and modelling the composition of meteorites (through the concentration of elements of Thorium and Hafnium in 44 samples), some astrophysicists have concluded that the "Red Planet" may have remained at its relatively small size by avoiding further collisions with other larger planetary embryos. Their results indicate that Mars grew before dissipation of the Solar Nebula's gas when roughly 100-km (62-mile) "planetesimals, such as the parent bodies of chondrites [stony meteorites], were still being formed" so that "Mars� accretion occurred early enough to allow establishment of a magma ocean powered by [the] decay of" Aluminum 26 (Jennifer Carpenter, BBC News, May 27, 2011; and Dauphas and Pourmand, Nature, May 26, 2011). On June 5, 2011, a team of scientists published an article in Nature which explains how early orbital in-migration by Jupiter (and Saturn) would have depleted the circum-Solar disk of dust and gas at the orbital distance of Mars so that the Red Planet had less mass to develop from. In the Grand Tack Scenario, Jupiter moved inward to settle for a while at Mars' orbital distance of 1.5 AUs before the Red Planet had developed after forming initially at around 3.5 AUs. Subsequently, depletion of gas and dust in that region of the circum-Solar disk allowed Jupiter to migrate back outward to their 5.2 AUs, and Saturn to around 7 then 9.5 AUs (NASA and GSFC news release; SWRI news release; and Walsh et al, 2011). In the later half of the 20th Century astronomers found that the four terrestrial planets are as not as similar as they once appeared. Human beings may be able to stand on their rocky surfaces without being crushed by gravitational force. However, only on Earth can they stand without special protection from inhospitable temperatures, atmospheric gases and pressure (or its absence), or Solar and cosmic radiation. In general, the conditions needed to support the type of large carbon-based life found on Earth may require an inner rocky planet that is orbiting a star in its so-called "habitable zone." Such zones are bounded by the range of distances from a star for which liquid water can exist on a planetary surface, depending on such additional factors as the nature and density of its atmosphere and its surface gravity. In addition, the range of star types that can support Earth-type life on rocky planets may be limited to those lower mass stars that "live" long enough for planets to form and complex life to evolve. The Kepler Mission is defining the size of an Earth-type planet to be those having between 0.5 and 2.0 times Earth's mass, or those having between 0.8 and 1.3 times Earth's radius or diameter. The mission will also investigate larger terrestrial planets that have 2 to 10 Earth masses, or 1.3 to 2.2 times its radius/diameter. However, larger planets will be excluded because they may have sufficient gravity to attract a massive hydrogen-helium atmosphere like the gas giants (Jupiter, Saturn, Uranus, and Neptune). On the other hand, those planets -- like Mars or Mercury -- that have less than half the Earth's mass and are located in or near their star's habitable zone may lose their initial life-supporting atmosphere because of low gravity and/or the lack of plate tectonics needed to recycle heat-retaining carbon dioxide gas back into the atmosphere (see Kasting et al). Of course, there are other physical characteristics that can affect the evolution of rocky inner planets in stellar habitable zones. For example, Venus today appears to be located in Sol's habitable zone, derived on from the Sun's current luminosity ("brightness"). However, the shrouded planet is now much too hot to support the presence of liquid water on its surface due to its heavy carbon dioxide atmosphere and sulfuric acid clouds which retain too much radiative heat from the Sun through a runaway Greenhouse effect. It's possible, however, that conditions on Venus may once have been more conducive to Earth-type life earlier in the Solar System's history when Sol was as much as a third less luminous than it is today. According to planetary scientist Robert M. Hazen, the Solar nebula of dust and gas that gave birth to the Solar System 4.7 billion years ago -- before our Sun, Sol, ignited into a nuclear furnace -- appears to have been comprised of only a dozen minerals, or crystalline compounds (Robert M. Hazen, Scientific American, March 2010: pp. 58-65). After Sol became a star, the infant Sun melted and mixed elements and minerals within the circum-Solar disk of dust and gas, and many crystallized into scores of new minerals. Many of these minerals (including the first iron-nickel alloys, sulfides, phosphides, and various oxides and silicates) solidified from drops of molten rock into "chondrules," which have been recovered in chondritic meteorites on Earth. In addition to rocky asteroids and icier bodies further out from the Sun, many agglomerated into larger planetesimals that eventually collided to form planets like the Earth, and more than 250 minerals, including olivine and zircon, developed within the planetesimals with the help of melting, collisional shocks, and reactions with water. Large planetesimals (some more than 100 miles or 160 kilometers in diameter) were big enough to partially melt and form (differentiate into) onion-like layers of minerals around a denser, metal-rich core. 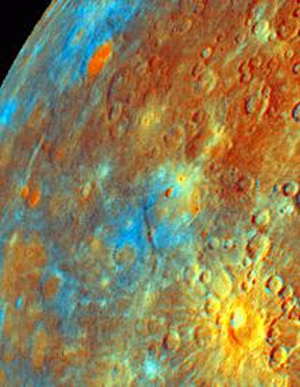 Larger image of Mercury's surface. ilmenite, iron content, and soil maturity (more). The formation and continued development of the four rocky inner planets is reflected in the number and diversity of minerals found on their planetary surfaces. Small and dry Mercury (as well as Earth's Moon) became frozen before much melting could occur, and so its surface may have no more than 350 different minerals. As Mars has some water that should have formed water-rich clays and evaporite minerals when its oceans dried up, the red planet may have as many as 500 surface minerals. Earth and Venus should have had sufficient inner heat to remelt some of its surface basalt to form a range of igneous rocks called granites or "granitoids," which are coarse-grained blends of lighter minerals (including quartz, feldspar, and mica that are common in Earth's crust but rarer in the smaller planetsimals). Remelting of granitic rocks concentrated rare "incompatible" elements and created more than 500 distinctive minerals rich in lithium, beryllium, boron, cesium, tantalum, uranium, and many other rare elements. Even more crustal minerals were formed by plate tectonics with the help of lubricating ocean water, atmospheric oxygen from the successful development of photosynthetic microbes, and land-based lichens (of algae and fungi) and mosses which were followed by deep-rooted plants that hastened the erosion and weathering of surface rocks with the help of biochemical action and the creation of soils as well as new clay minerals . As a result, Earth's surface today has more than 4,400 known mineral "species," of which more than half appear to owe their existence to the development of Earth-type life, and so its surface minerals are also a planetary signature of the presence of life. For more information about the Solar System, go to William A. Arnett's website on "The Nine Planets", or to Calvin J. Hamilton's website on " "The Solar System."